The waterproof/breathable Typhoon Jacket is Mountain Hardwear's entry in the affordable semi-technical rainwear/shell category. The Typhoon thus joins the popular family of moderately priced but higher-performing waterproof/breathable shells like North Face's excellent Venture Jacket or Marmot's PreCip. All are very light, and all push at least somewhat into the zone of technical/alpine applications, where previously only $300+ shells were available. Unlike the Venture or PreCip Jackets, however, the Typhoon features top-shelf Gore-Tex PacLite™ construction, easily making it one of the more appealing members in the clan. When it comes to hard shells, for many people nothing else but GoreTex will do. PacLite fabric (we presume) offers the highest breathability in a waterproof hard shell compared to other choices like HyVent or PreCip technology. Still, until you move to a boutique fabric like Event or Epic, we're not convinced that the distinctions in breathability between the various hard-shell fabrics are significant in real-world use. The Typhoon Jacket features a roomy fit, and the usual suspects of features, like core zip vents, taped seams, a brimmed hood with draw cord and a flap to stow it when not in use, a waist draw cord, and wrist cinch straps. At 15 ounces in a men's medium, the Typhoon easily qualifies as ultralight. In terms of style, Mountain Hardwear offers the Typhoon in a variety of colors, including some two-panel designs, making this arguably a better looker than its TNF and Marmot competitors. So let's call the primary selling points looks, affordable PacLite fabric, and brand loyalty. Aside from these perks, the Typhoon is otherwise very similar to the Venture and PreCip shells. Each has its own strengths and (minimal) weaknesses. 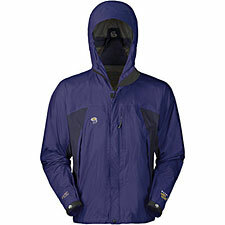 The PreCip unquestionably wins as the least expensive and the lightest of the trio. The Venture has the sturdiest feel of the bunch, inspiring more confidence in alpine applications. And the Typhoon is built of the undeniably high-end PacLite. That makes the Typhoon arguably the best choice (as its name implies!) for genuinely abominable rain downpours, or other situations where getting soaked is your primary concern. Just remember: these distinctions are all matters of fine degree. For semi-technical use, you can pick any of these shells with confidence.